Hello. As you know, the default administration panel in CS-Cart and Multi-Vendor isn’t responsive. Its size on a mobile device is the same as on a desktop, so you have to scroll the page not only vertically, but also horizontally. That is very inconvenient, so we have developed a responsive administration panel and we’d love to hear your opinions about it. We are planning to develop it further and to eventually make it default for CS-Cart and Multi-Vendor. 1. Go to Add-ons → Manage add-ons. 2. Switch to the Browse all available add-ons tab. 3. Find the Responsive Admin Panel [Beta] add-on and click Install. 4. Change the status of the add-on to Active after the installation. 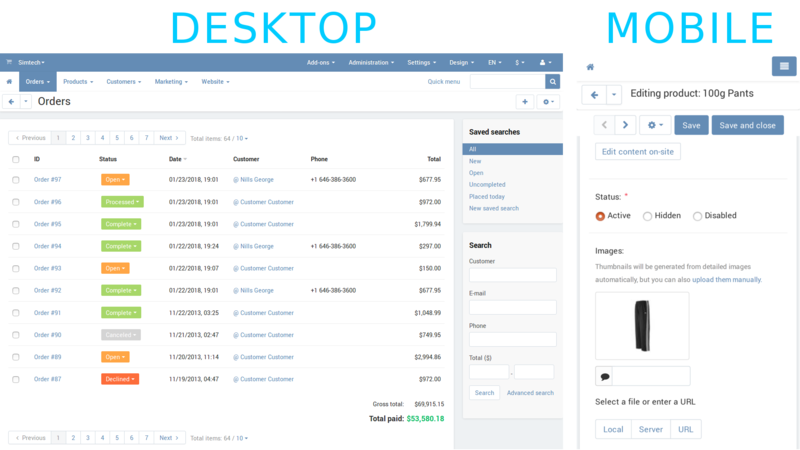 After that the look of your admin panel will change, and you’ll be able to make use of its responsive design. The best part is that the responsive admin panel is backward-compatible: the technologies behind it haven’t changed. Everything is where it was in the old admin panel; we only adjusted the styles and added some wrappers to HTML tables. When we were developing the new admin panel, we also tested it with a few third-party add-ons, and they worked fine. Now is the best time to make any changes, so please try the responsive admin panel and let us know what you think. Do you find it convenient on mobile devices? What can we improve? We’re looking forward to your feedback in this topic. Nice addition, customization would be nice too..
Looks very nice, maybe update the language flags as well to fit the Flat UI look? Furthermore, it would be nice if you can pick a 'theme color'. I have some clients who use multiple CS-Cart installations (they want seperate stores and not a 'multi store', I have recolered their backends to fit their frontends, they wanted this to make it easy to distinguish these multiple installations. Not accessible for me either. "Server cannot be found." There are a few problems in my opinion (very small ones though). - Whenever the top menu becomes fix it will add a shade to the 1st level. This makes it look less seamless. - Whenever you access a third level drop you have to / can scroll sidewards. - Maybe replace the scroll bars with some better styled ones? - When you have the one of the menus opened in mobile view and you switch to desktop view the menu will disappear. - Product name floats without a background (when editing products). - You can scroll down forever, it resprings a few pixels back to the top everytime (product editing). - When in tablet mode the menu makes no sense, the subitems should be a full width, preferably even a hamburger menu (this would benefit from the overall flow where you have gone for). - Subitems appear on hover, they should be toggled in mobile view as right now it is impossible to use it if you have e.g. a tablet with a mouse (yes this does actually exist). - Checkboxes are very tiny, if you are on a mobile device they should be made a fair bit larger. - The need help button appears on top of the action buttons (save, export, etc). - Make the fold out menu full height, now it is cut off for 10% on the top. Where is the bulk select tools for bulk delete order invoice etc? Looks like you maintained class names which is good. Are there any special classes that need to be addressed for addon developers that manipulate the admin screens and sideboxes? Sorry for the broken URL. I've updated it in the main post, so it should work now. If it doesn't, just go to http://dev.demo.cs-cart.com and add admin.php at the end of the URL to access the admin panel of your instance of the demo. How does this affect the third party add-ons? When we were developing the responsive admin panel, we focused on preserving backward compatibility and tested a few third-party add-ons with the new panel. The technologies behind it remain the same. We simply changed the looks by altering CSS and made the tables responsive by adding <div> wrappers around them and adding data attributes to columns. That's all I can say so far without consulting the developer further. Please let me know if that answers your questions. its removed from marketplace? have any update? We're addressing a few issues we found in the add-on, so it isn't currently available on the Marketplace. For the time being, the add-on can be tested on http://dev.demo.cs-cart.com/admin.php. Once there is any news, we'll announce it on the forum (probably in this topic). I have downloaded it, if @ikoshkin is fine with it I can send it to you? By the way, there is one more issue I found. - All the icons in the block management page are not aligned, they are not centered whatsoever.